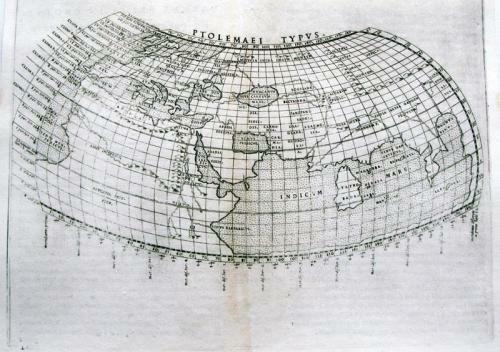 Engraved by Sanuto for Ruscelli's 'La Geographi di Claudio Tolomeo'. A feature of this first state is that the platemark runs off the top of the sheet: two maps were printed from the same plate then the resulting sheet cut in half. Text on verso. Good condition, washed, cleeaned & deacidified. Centrefold splits (t&b) professional repaired. Worm tracks in lower margin backed with spider tissue. Splits & tracks outside of image area.